Home Featured Is This Stock ‘The Next Google’? One thing that I have grown to appreciate about investing is that it is a pursuit that you get better at over time. This is a game in which experience counts. And there is no experience that provides a better source of investment lessons than the mistakes you’ve made yourself.Mistakes aren’t always those of commission (although I’ve made plenty of those). There are also errors of omission, as in things that you didn’t do but should have. For example, in 2004, when Google (Nasdaq: GOOG) had its IPO, a friend of mine pounded the table and told me that I “had to own” the company. I thought he was crazy because to me Google looked very expensive on both a price-to-earnings (P/E) and price-to-cash flow basis. I was wrong. While Google did look expensive relative to other companies, it was not even close to being expensive relative to its future earning power. What I didn’t appreciate was that Google had a tremendous moat around its business and massive growth in front of it. Google’s share price went from $50 in 2004 to well over $500 today. The lesson I learned is that it is worth paying up (within reason) to own the very best companies with the very best growth prospects. A high rate of growth can quickly make an expensive looking share price appear like a real bargain. Today I’m taking the lesson I learned from Google a decade ago and applying it to Priceline Group (Nasdaq: PCLN). This is an unusually high-quality company with very compelling growth prospects ahead of it that make its current valuation an attractive entry price. Priceline’s stock chart is a thing of beauty. A few years ago, a chart like this would have left me thinking that I had missed the boat on this company. Today, I think differently. What the stock price has done in the recent past is completely irrelevant. All that matters is the price you pay to today relative to the future earnings the company will generate. Priceline has established itself as the 800-pound gorilla of the online travel industry. Its products include Booking.com, which provides online hotel reservation services on a global basis. The moat around this business is the nearly 425,000 hotels in Priceline’s network and the 30 million unique visitors to its website each month. Priceline has had fantastic growth in recent years: Its earnings have grown from $193 million in 2008 to $1.9 billion last year. That is a compounded growth rate of almost 60% over five years. With that kind of growth, Priceline should be an expensive stock. That is what we can see out of the rearview mirror. What matters is what lies ahead. Despite its recent growth and well-established competitive moat, Priceline still only controls 4% of the global travel booking market. Priceline could double its market share and still not control 10% of the market at its current size. The wind at Priceline’s back is the continued move to online booking by people all over the globe. The traditional travel agent is going the way of the dinosaur. Today, with a share price near $1,160, Priceline is trading at an eye-opening 33 times its $1.9 billion in earnings over the past 12 months. Ten years ago, that multiple would have been enough to send me on to the next company. Today I’m keeping an open mind, and if we look forward five years, the current share price may actually turn out to be a bargain. 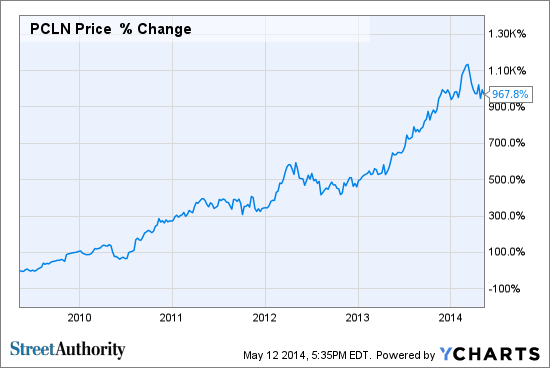 Over the past five years, Priceline has increased earnings at a compounded annual rate of 60%. That rate of growth might not be sustainable, but even if assuming that Priceline’s rate of growth slows to 35% over the next five years, the company would have earnings of $8.5 billion in 2018. At a market earnings multiple of 20, that $8.5 billion of earnings would give Priceline a share price five years from now of $2,901 — 250% higher than where it is today. That is an attractive return, and I might be overly pessimistic in applying a 2018 P/E multiple of only 20 to a company growing earnings at 35% per year. My experience with Google opened my eyes to the power of a dominant company in a high-growth business. I wouldn’t pay such an expensive multiple for just any company — but I would for the right high-return business. Priceline enjoys a high rate of return and posted an excellent 35% return on equity in 2013. The company is able to achieve that high rate of return on equity because, like Google, it has built a protective moat around its business. Priceline’s network of hotels and 30 million Web visitors a month see to that. However, that high rate of return actually creates a risk for Priceline. Returns on equity like what Priceline is earning tend to draw powerful companies with big bankrolls looking for a piece of the action. One such potential competitor is actually Google which recently made some noise by establishing some relationships with hotels. Risks to Consider: At 33 times earnings, Priceline’s trailing P/E is higher than the market average. In a severe correction, higher-multiple stocks get hit the hardest. Also, the online travel business is a high-margin industry that attracts a lot of competition. If bigger, better-financed companies start aggressively focusing on online travel, it could slow Priceline’s growth rates. Action to Take –> Over the long term, I expect Priceline will prove a good investment at its current price, but with the market five years into a bull run, it is possible that a sell-off is coming. A buy-and-hold strategy should serve investors well at the current share price, but accumulating shares on the dips might work better. P.S. With its wide moat, Priceline has one of the characteristics my colleague Dave Forest looks for when he’s hunting for “Forever Stocks.” In fact, Dave and his staff recently went looking for the absolute best stocks on the market — those worth buying and holding “forever.” After six months and $1.3 million worth of research, the team was successful. To learn more about the “Forever Stocks” they uncovered — including some names and ticker symbols — click here.